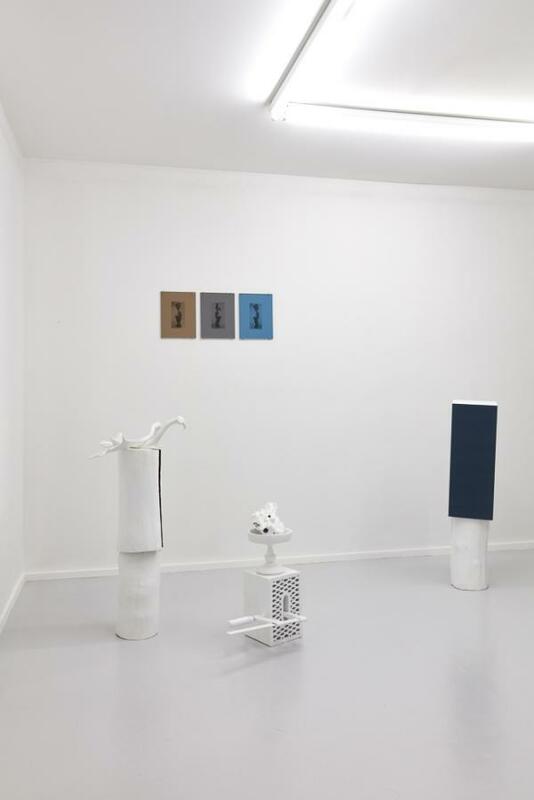 MLF l Marie-Laure Fleisch is pleased to announce Patrick Carpentier’s first exhibition at the gallery, A SHORT-TERM EFFECT, AN ECHO. Often taking lyrics from songs by the British rock group The Cure, the artist evokes a certain period in time. The word “echo” is essential, as throughout this exhibition the spectator is confronted with works which develop in multiple forms or variations, evoking a sense of familiarity. 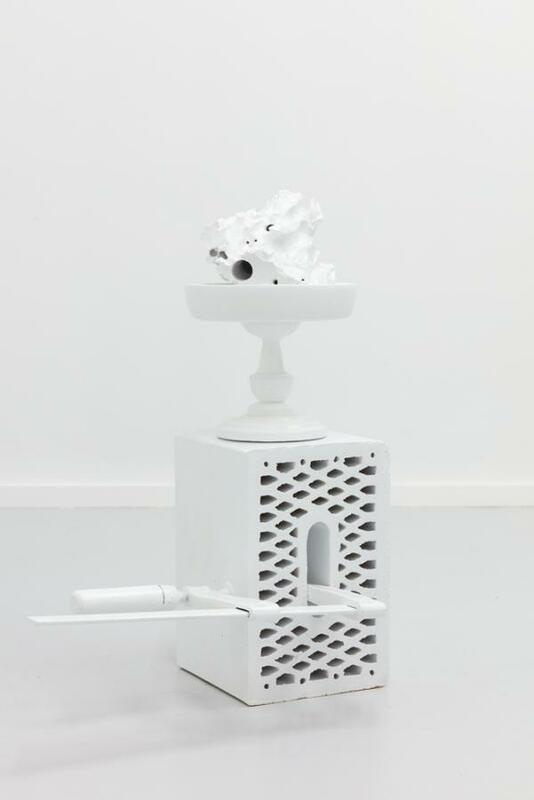 Working with the idea of assemblage as the main concept for the exhibition, the artist presents a series of sculptures in ceramic, metal and mixed media, as well as a series of collages. 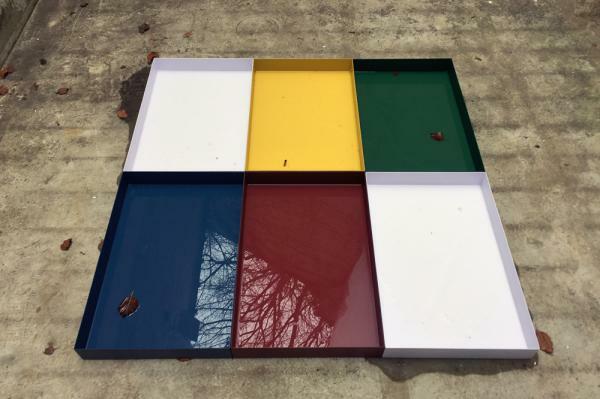 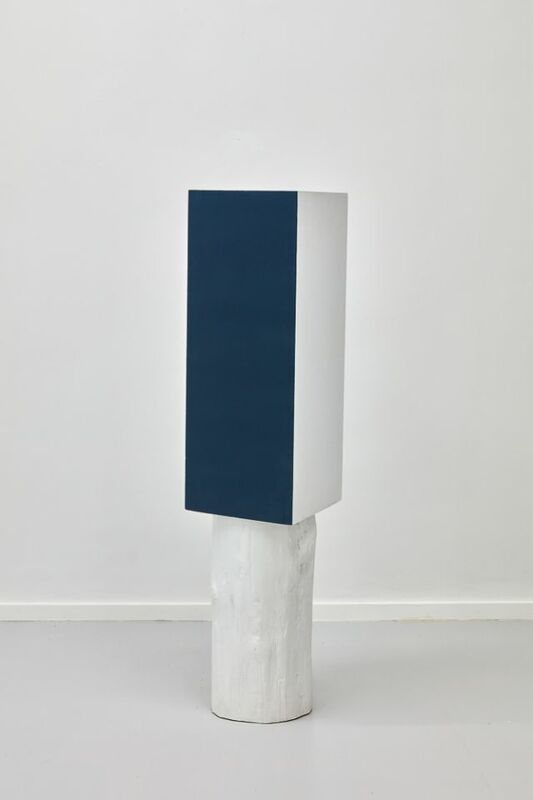 Largely inspired by themes of adolescence, wonder and geometry, often in relationship with the notion of play, Carpentier works primarily with sculpture and photography. He modifies and combines familiar forms, imagery or graphics to transform the original item, creating new and surprising ways of seeing. 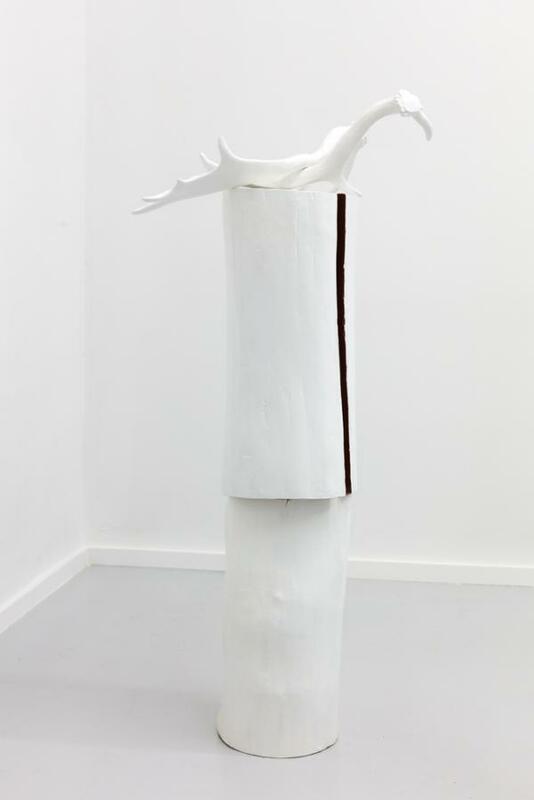 References to early 20th century art history and so-called primitive art are omnipresent in his oeuvre, and these elements are frequently rejuvenated with links to pop culture, such as lyrics by The Clash or forms inspired by skate parks. 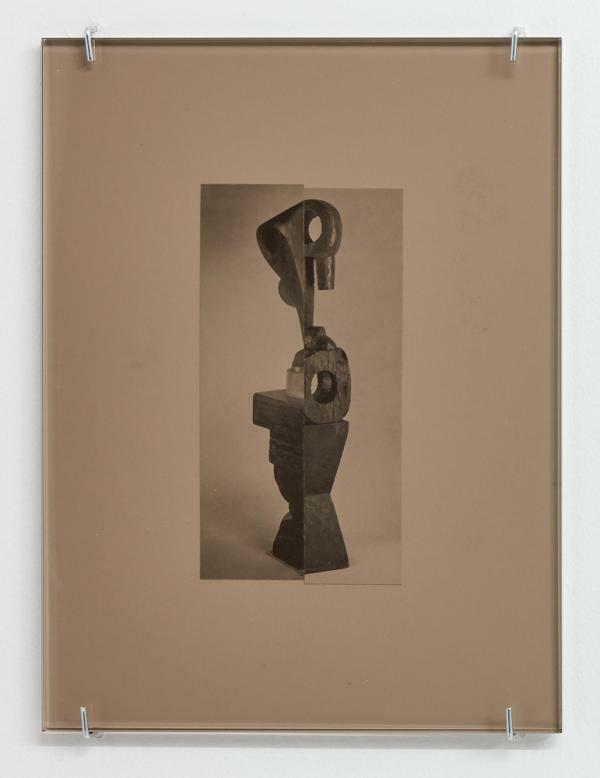 Techniques such as collage and assemblage are primordial in Carpentier’s work, whether working with pages from books, photographs, or objects in his studio which are then combined to create a sort of Exquisite Corpse. 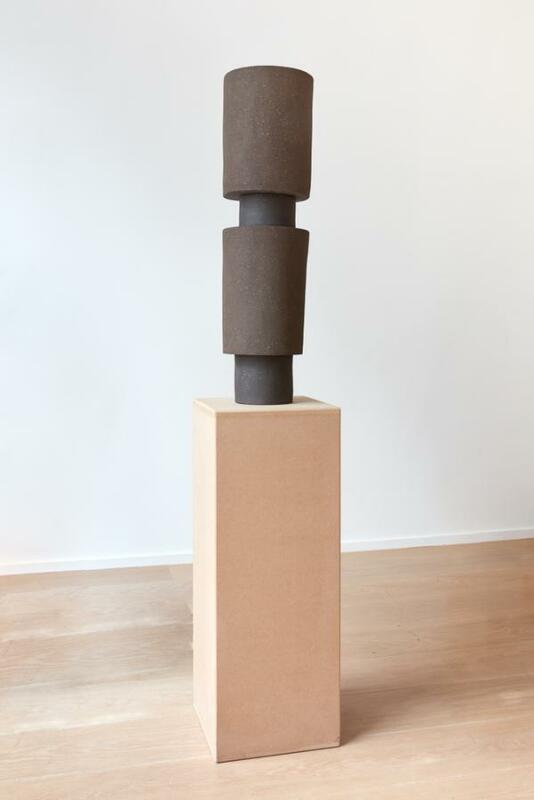 In the main room of the exhibition, the visitor is confronted with large, earthy, ceramic sculptures on pedestals of varying heights. 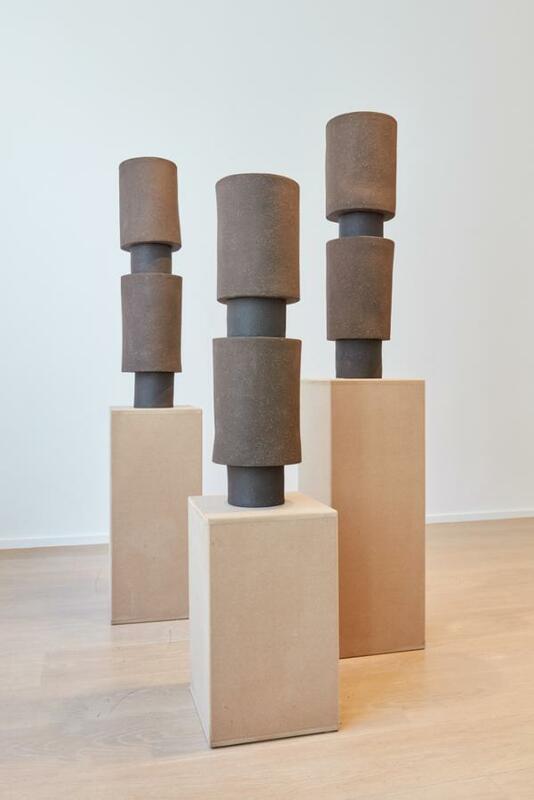 These forms take on an anthropomorphic quality, inciting a physical relationship between the moving bodies of the spectators and the stationary characters on top of the plinths. 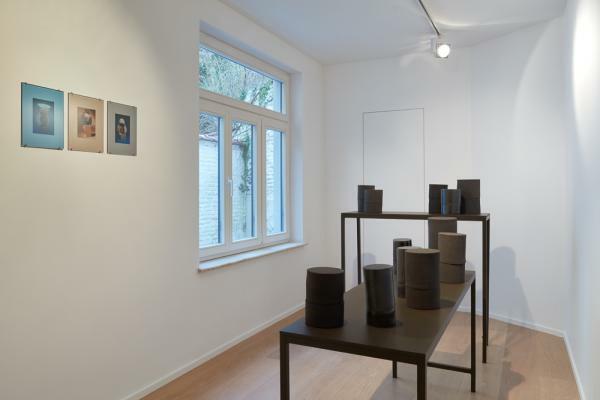 The play of scale is shifted later on the exhibition, where a series of small ceramic sculptures are presented in multiple sizes and variations. 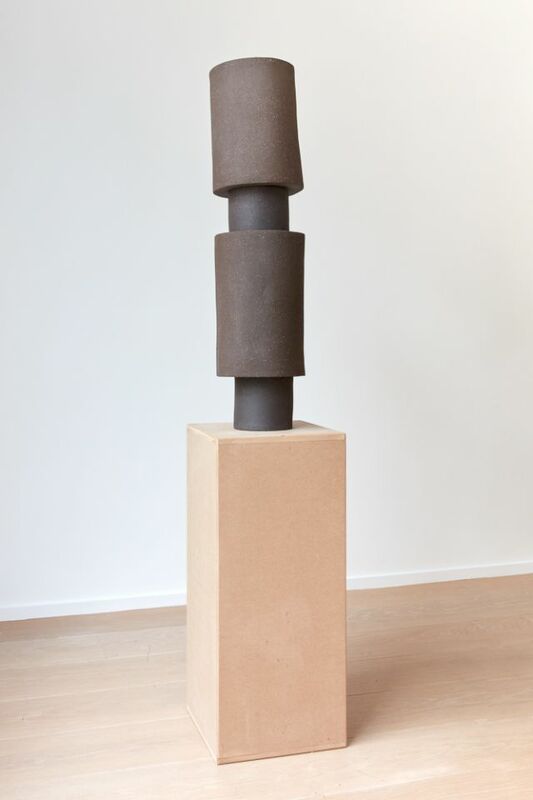 Handmade and constantly at risk of ruin during the processes of firing and glazing, these sculptures have an inherent fragility which is accentuated by stacking the uneven forms on top of each other, creating forms reminiscent of early 20th century sculptors such as Brancusi. 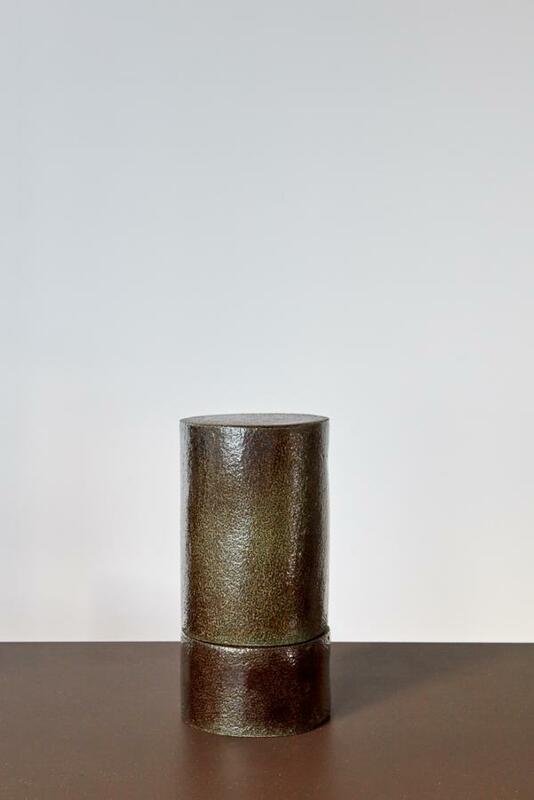 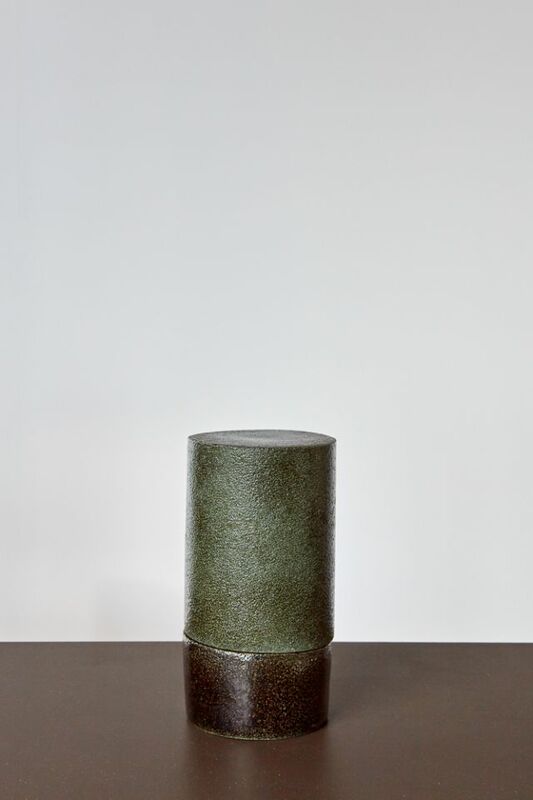 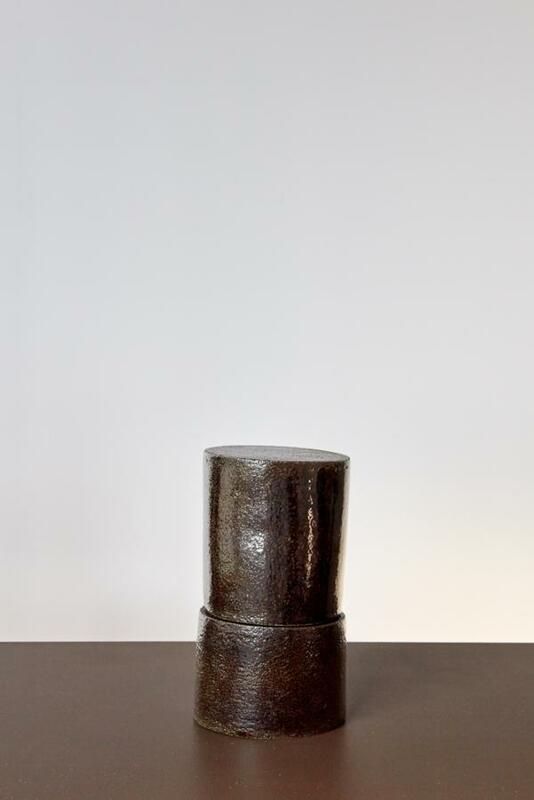 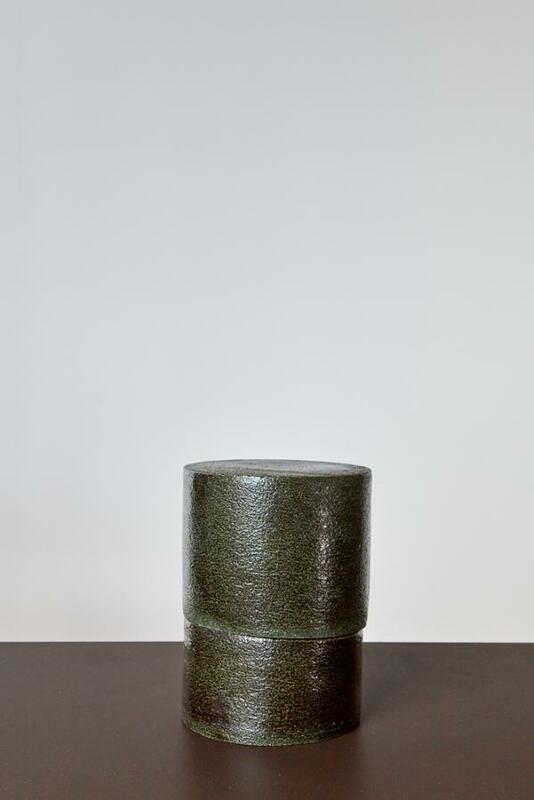 While some remain unglazed, revealing the grainy texture of their surfaces, others are glazed using a colour scale evoking Morandi, or with a metallic sheen, doting the sculptures with a certain preciosity. 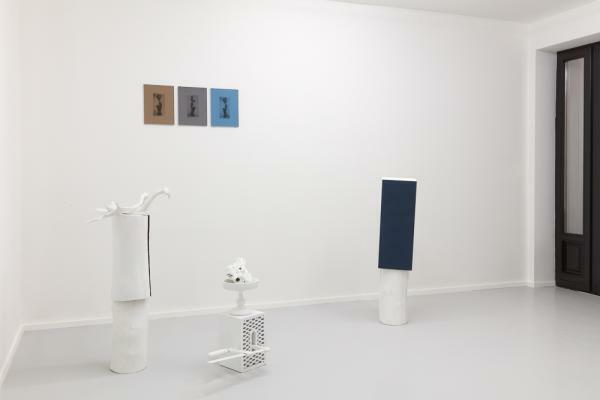 Departing from ceramics, two other series of sculptures are shown. 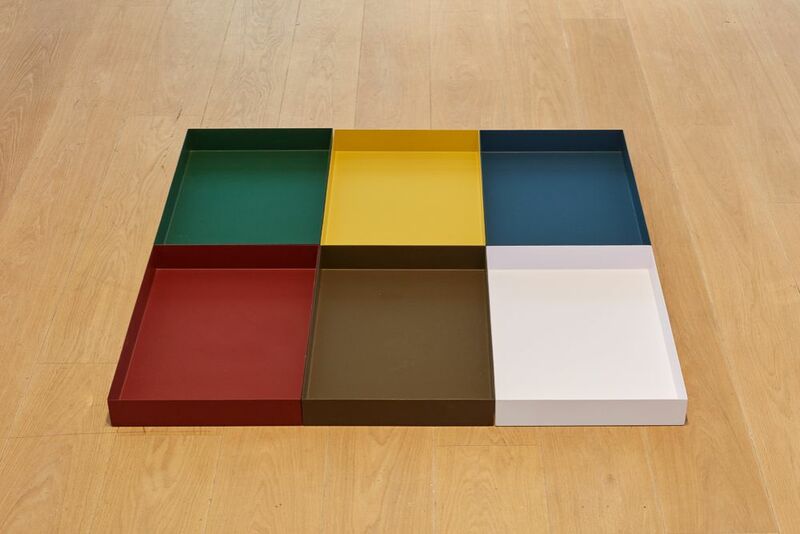 The first works that the viewer come across are shallow rectangular forms, fabricated in metal and glazed with car paint. 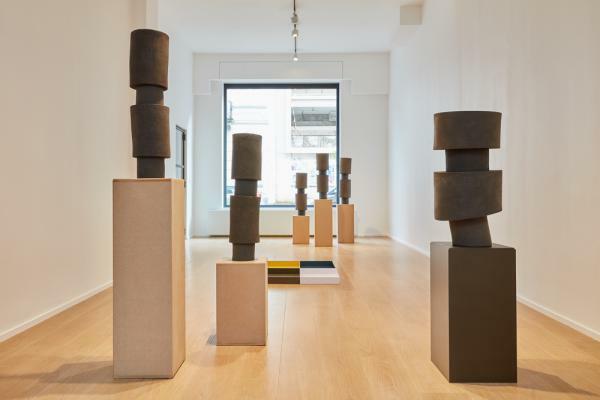 In spite of these slick materials, the works have a certain softness which is given by the use of matte paint and the Morandi-esque colours that are omnipresent in the exhibition. 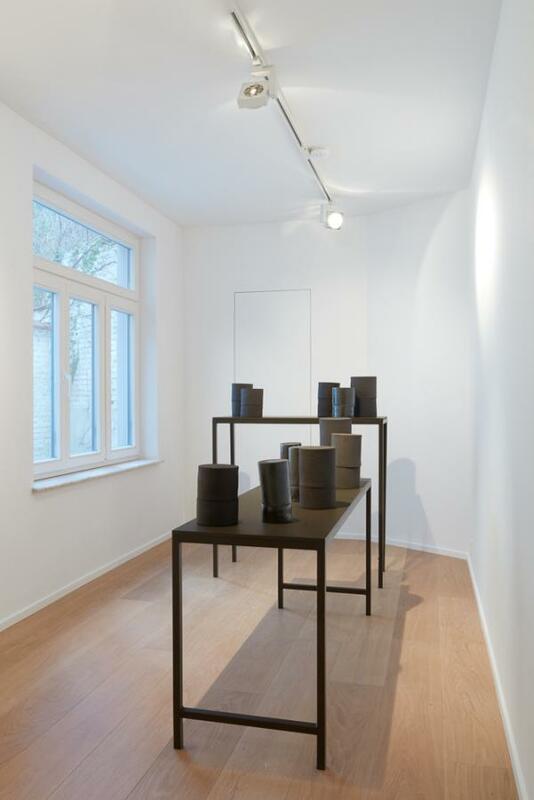 Identical basins are also shown in the courtyard, and the rainwater and debris collected in the latter works brings the viewer’s attention to the emptiness of the former. 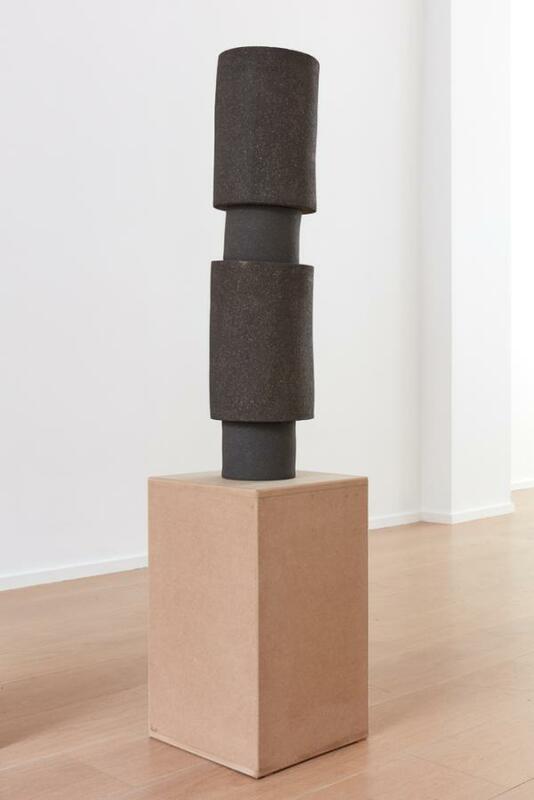 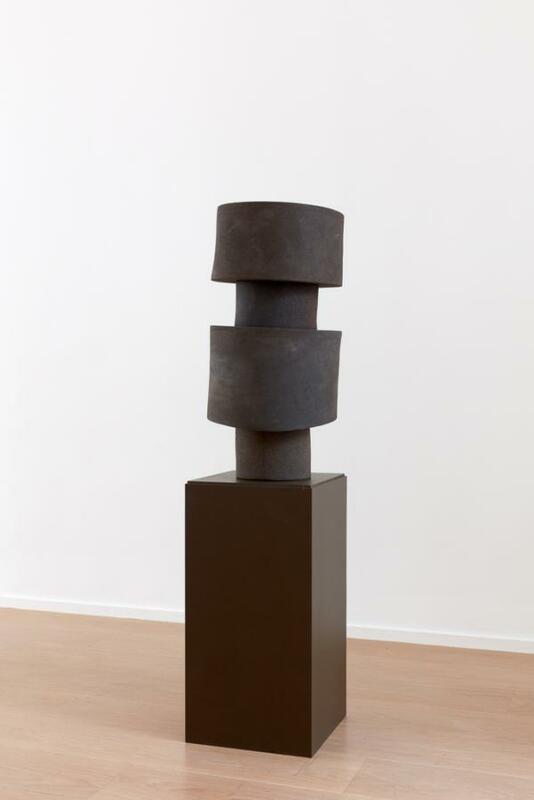 Other sculptures combine various materials such as bricks, logs or antlers, which are then combined and painted homogenously to give a uniformity to the ensemble. 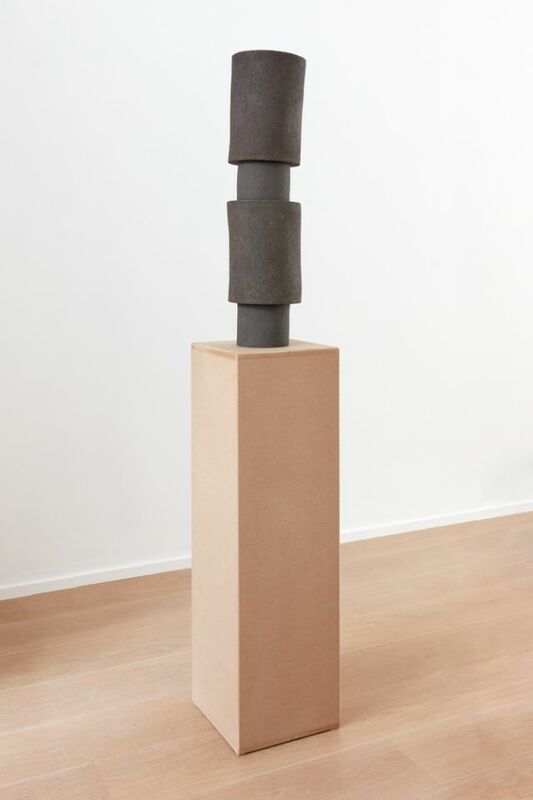 The materiality of each separate component is thus masked at first gaze, and it is only upon a more attentive inspection of the works does one recognize their compound aspect. 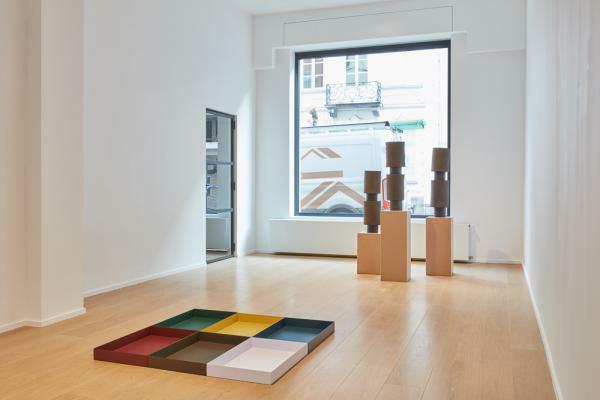 This becomes a sort of game; the humorous approach by the artist is transferred to the viewer, who engages in the adventure of identification. 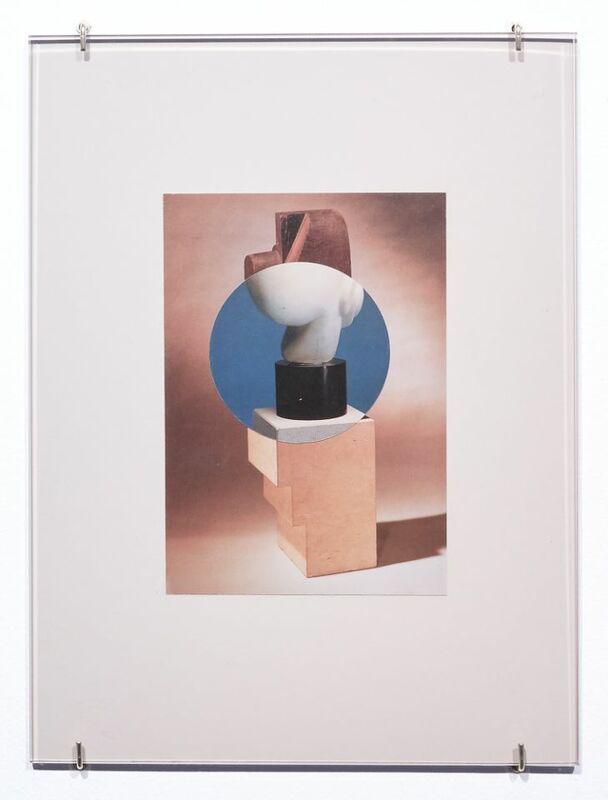 The notions of play and assemblage, as well as the artist’s fascination with early 20th century art history and “primitive art”, are exemplified with Carpentier’s collages. 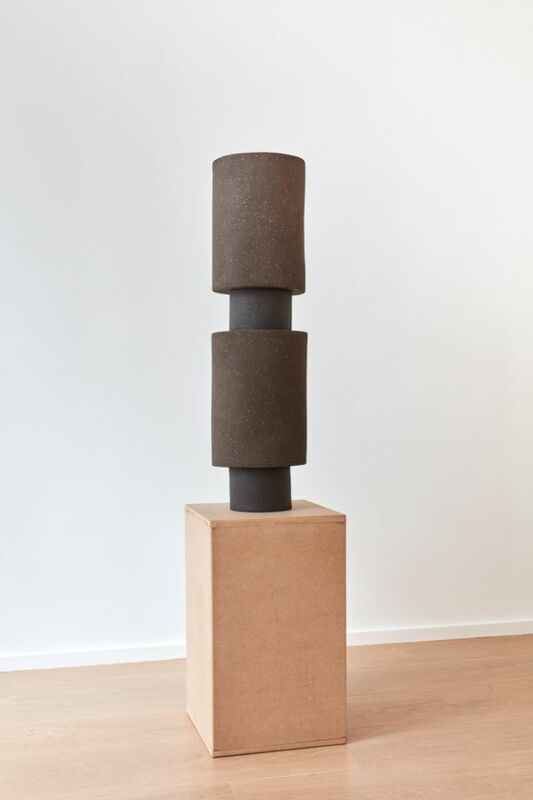 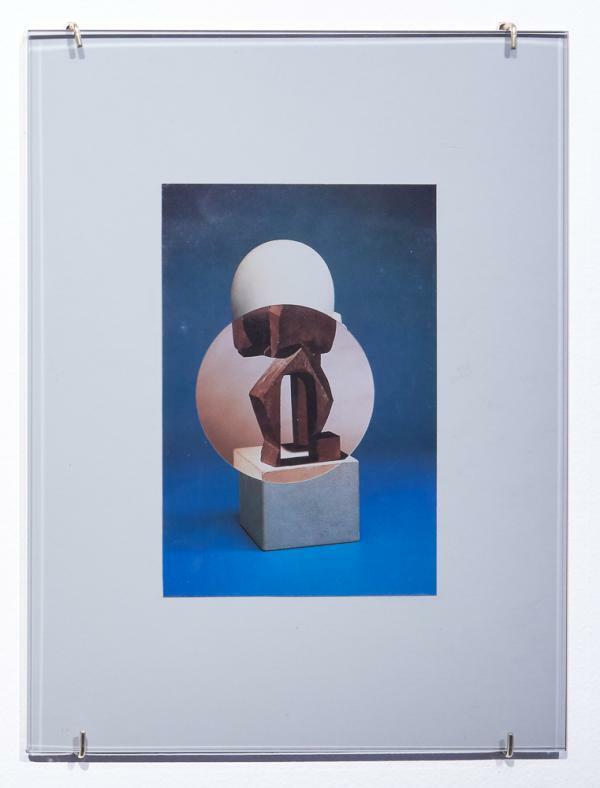 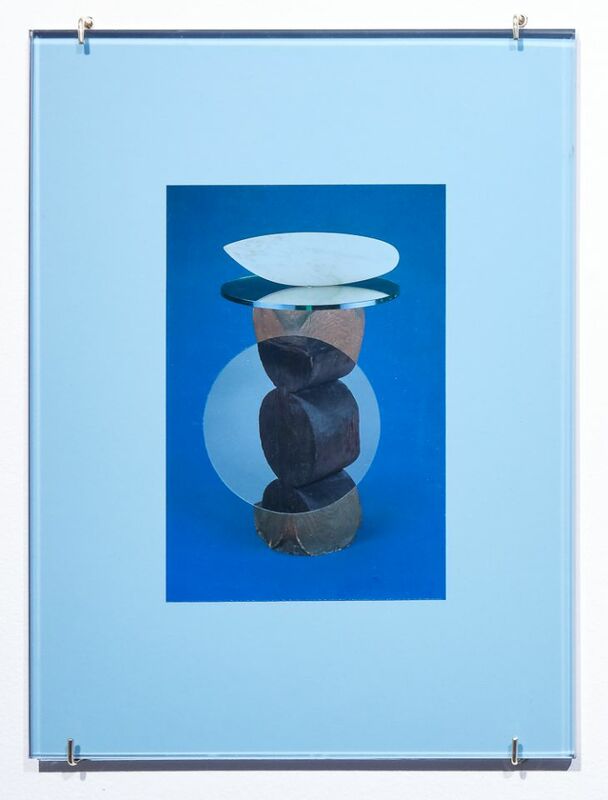 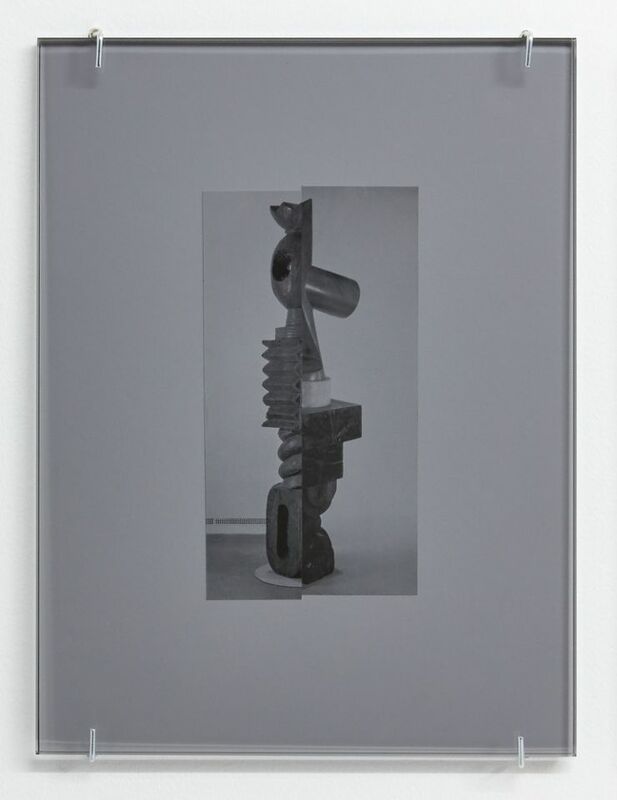 These works are composed of images of Brancusi’s sculptures, taken from the book Brancusi by Eric Shanes, in which various views of the artist’s studio are represented. 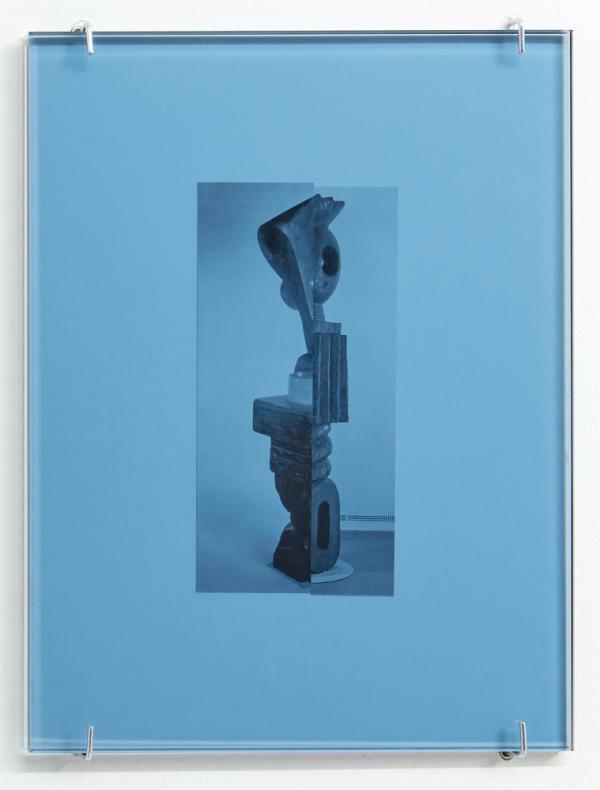 Carpentier then takes his multiple copies of this book and splices the images together to create new balances and forms with Brancusi’s modernist building blocks. 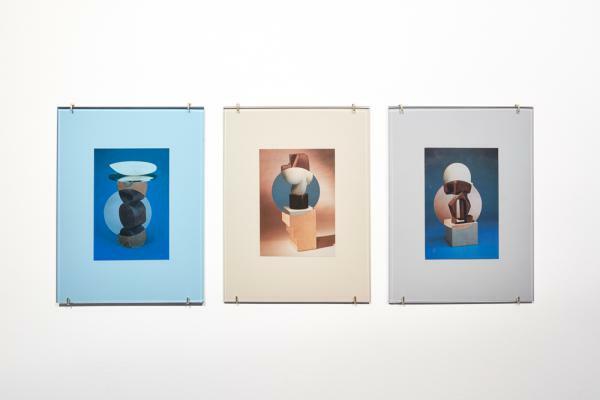 The images are then covered in tinted glass of various thicknesses, which intensifies the colour and gives one the impression of different hues as a result of the varying densities of the glass. 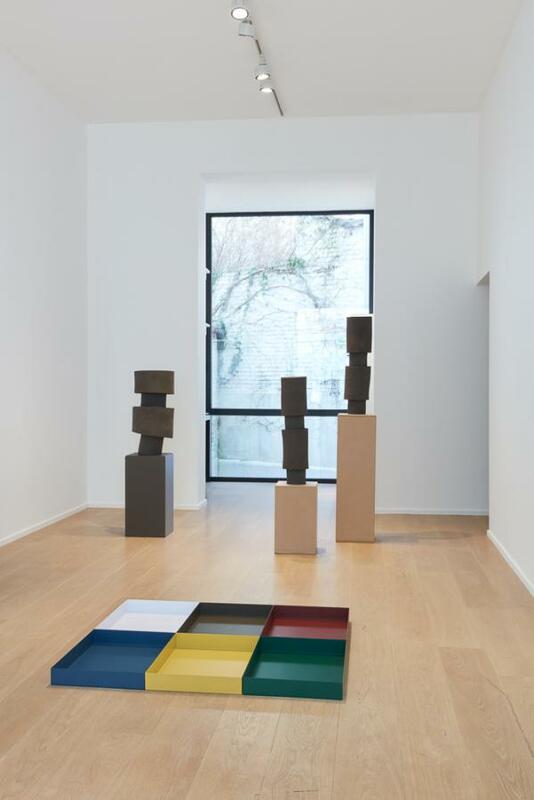 Lives and works in Brussels.